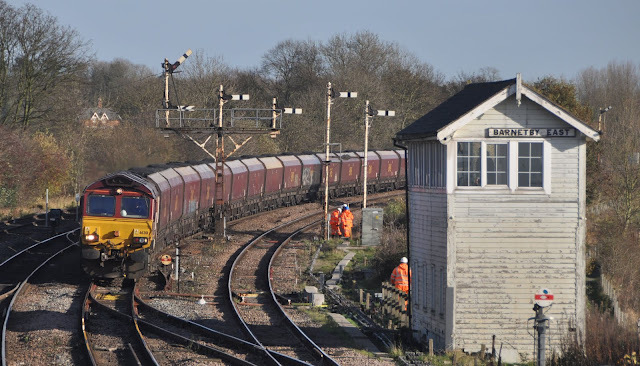 The semaphores at Barnetby East sadly did not see out 2014 as they fell victim to the North Lincolnshire resignalling project at the end of the year. Coal traffic also vastly reduced with the reduction in generation at coal power stations and the closure of further collieries. 66201 is seen at Barnetby in November 2015. 2015 has once again proven to be a fascinating year on the railways. Here in the UK we have seen the railways once again attracting more passengers than ever as well as maintaining a fantastic safety record. The year saw the full roll-out of class 68's to Chiltern Railways mainline services- a new locomotive class that has rightly already got a great following. While Chiltern have seen new locos take up squadron passenger service it has also been fantastic to see some old favorites return to use. When Arriva Trains Wales finally dispensed with class 37 haulage on the Rhymney Valley line in 2006 few could have imagined that in 2015 it would once again be possible to sample the fantastic class 37/4's on regular passenger trains. The 37 hauled operation on the Cumbrian Coast has to be one of the most interesting developments for enthusiasts in many years. 37's have also returned to East Anglia displacing class 47's (which have, for now, no booked passenger work) on the Angilan 'short set' which shuttles between Great Yarmouth and Lowestoft. Interesting traction times have also abounded for the new operator of the Caledonian Sleeper which due to unreliability of it's class 92's and a wait for delivery of new class 73/9's has led to a range of traction seeing use on it's trains including class 47's and even heritage electric class 86's and the sole UK registered class 87. Of course as well as positives there are also some losses during the year including the closure of the last deep coal mine in the UK and the vast reduction in the tonnage of coal being moved on our railways. The loss of the traditional semaphore signalling in North Lincolnshire will disappoint many photographers across the country- the freight hotspot of Barnetby will never quite be the same again and I was sad that I could not join the many other enthusiasts who headed up for one last time in the last days of semaphore operation. On a personal note 2015 has been a great year for me. Joining the railway profession 12 months ago was a move that has most certainly paid off (and kept me busy!) and I look forward to many more years in this fantastic industry wherever it may take me. 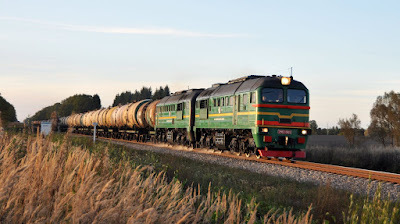 I have also had the chance to enjoy some great rail trips to some of the regular destinations in near Europe as well as some more exotic trains in the former USSR states of Latvia and Lithuania as well as something really quite different more recently in Sri Lanka. Regular readers will also have noticed that this blog is now updated almost every week. My readership is up once again in 2015 and the number of posts during the year has almost doubled. Looking ahead to 2016 it is almost impossible to predict what surprises the railway may have in store. It looks as if we may seen further class 37's returning to the mainline from the Heritage sector and as the railway continues to grow further new trains will be delivered throughout the year to boost capacity. In Europe it has sadly already been announced that all sleeper trains run by DB in Germany are to cease, while elsewhere it is likely that the number of traditional loco hauled trains will continue to reduce. Whatever 2016 brings I hope you find it enjoyable and, as usual, I am sure the railways will not fail to surprise!